James McDaniel ’12, a biology major from Madison Heights, Va., was one of nine students selected from across the U.S. to receive a PLANTS grant from the Botanical Society of America to attend BOTANY 2011, the annual scientific conference for the Botanical Society of America, Society for Economic Botany, American Fern Society, and American Society of Plant Taxonomists. James was nominated by his advisor, Dr. Nancy Cowden. 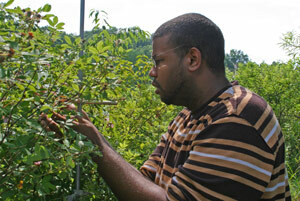 He is doing a summer research program with Dr. Cowden and Dr. Priscilla Gannicott on rose fragrances. The goal is to compare fragrance production in known cultivated roses with their antique and wild ancestors. The PLANTS program is funded by the National Science Foundation and Botanical Society of America to bring talented and diverse undergraduates to the BOTANY 2011 meeting on July 9-13 in St. Louis, Missouri. The theme this year is “Healing the Planet.” The meetings include symposia on medicinal plants, economic botany, and conservation of the world’s tropical forests (including forest management by indigenous people), as well as sessions on plant systematics, plant genomics, pollination biology, population and community ecology, and incorporating microbes into plant community ecology.